Across the courtyard, mothers with small children and a few older men wait as the Medair medical team unloads boxes of medications and prepares to open today’s clinic in Sinjar, Iraq. Across the courtyard, mothers with small children and a few older men wait as the Medair medical team unloads boxes of medications and prepares to open today’s clinic in Sinjar, Iraq. Here, in a smaller room with a circle of plastic chairs, I watch as a group of young women shyly enter and find their seats; each carrying a small notebook. I’m slightly nervous; I have attended many clinics but today I am joining the psychological support group where people will be sharing their mental health struggles. My camera feels intrusive, and I am more conscious than ever that I am asking people to share their life’s details with a virtual stranger. This is the fourth of nine weekly group sessions led by Psychosocial Support Officer (PSS) Hussein. As the group settles he explains that my job is to tell the story of mental health support in Iraq. All of the participants give permission for me to take photos and to share their personal stories. Before the crisis of 2014, when armed groups swept across this area and many people were kidnapped or killed, this town was bustling with 35,000 people. Today about one-third of the families have returned; each one having their own story of loss, trauma, and fear, the effects of which linger even years later. One of the exercises in today’s session is about community networking. 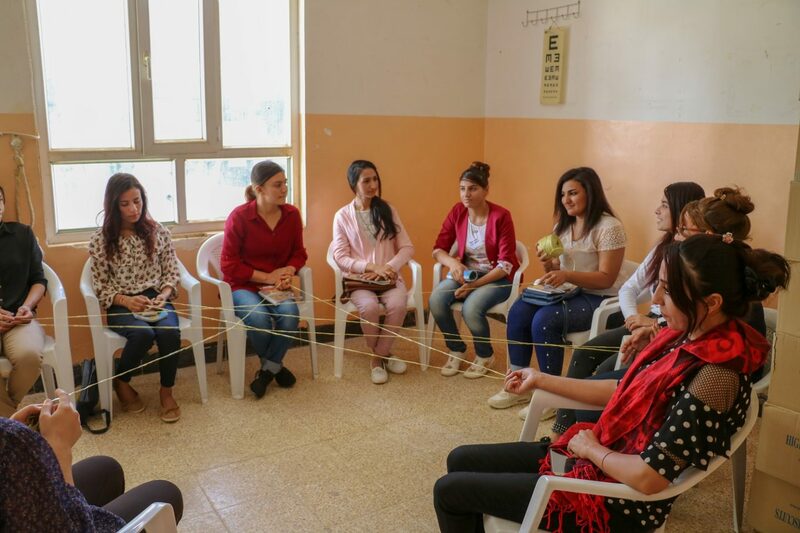 A ball of string is passed from one person to the other, with each person holding on to part of the string and taking on the role of someone in the community. As the string builds a ‘web’, the group talks about how teachers, doctors, shopkeepers, and everyone else play a role in building a healthy community. In addition to group sessions, Hussein offers people the opportunity for more support through individual sessions. Serious cases requiring psychiatric help are referred to hospitals in larger centres, and Hussein follows up with those patients. As the session goes on, the group becomes more talkative; more comfortable with sharing their stories. I am impressed with how much they have learned in just a few weeks, and how eager they are for more. The discussion is not dwelling on the past, or on their own suffering and trauma. Each person here is focused on how to help their family and their community. After the group disperses I sit in the garden making notes and checking my photographs. After a few moments a woman approaches me and begins to show me a gallery of photos on her phone. She is speaking to me in Kurdish, but I don’t understand. 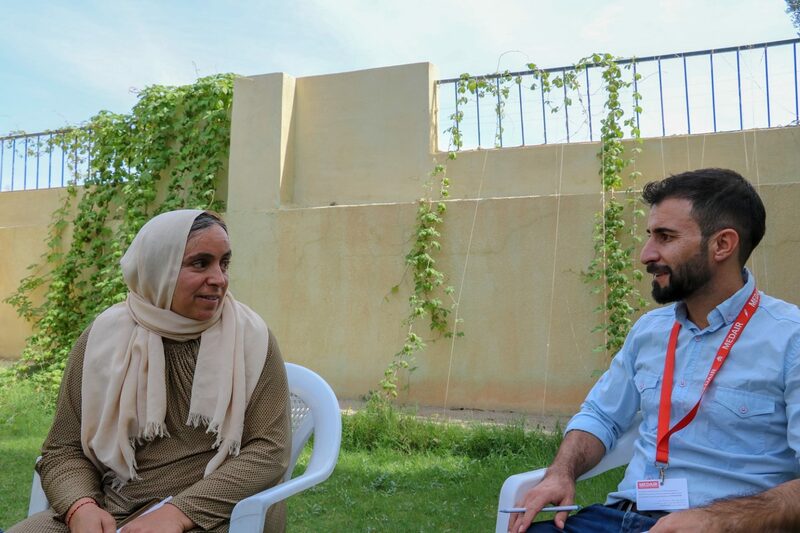 I find Salma, another of our Medair psychosocial support officers, who has been translating for me. My heart drops as Salma introduces me to Shary and explains that the photos are of family members who were kidnapped in 2014. In total 76 were taken, and 41 are still missing. Hussein joins us and explains that Shary has attended the psychosocial support group and now comes for individual counselling. 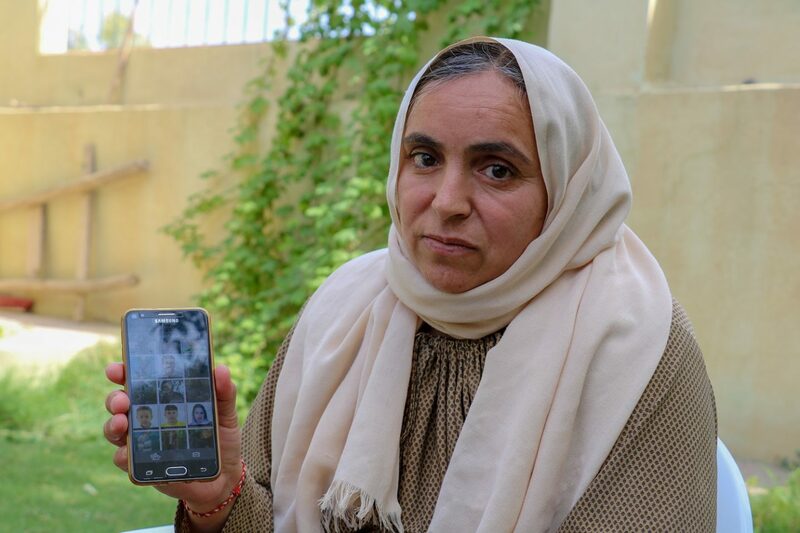 Her son Diar, 11 years, also sees Hussein for mental health support. Before the crisis, Shary and her two sisters had a well-known women’s salon; a busy place where all the women came for hair and makeup before a big party or celebration. They were close; always together. Two of her sisters were kidnapped; one was returned and has emigrated to Europe with the help of an NGO. The other is still missing. 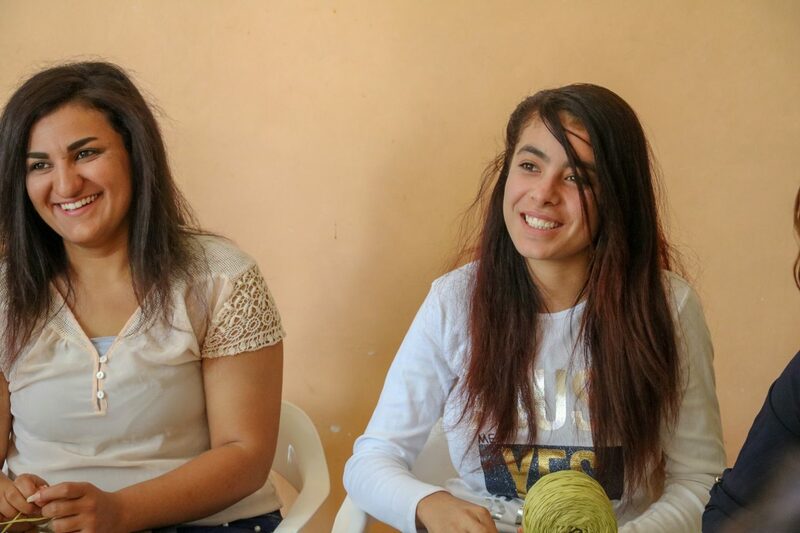 As Shary talks with Hussein and Salma, sometimes a small smile crosses her face and it’s obvious that she is feeling better than when she arrived. As we pack up and leave the clinic for the day I reflect on my initial nervousness. I couldn’t have been more wrong. I marvel at the warmth and inclusiveness I felt offered to each person involved in the group; even a guest like myself. I can understand why this programme is so powerful in bringing communities together and strengthening the mental health of people who have experienced trauma. Since then I have found myself thinking quite frequently of Bushra, Sharya, and the others I met. 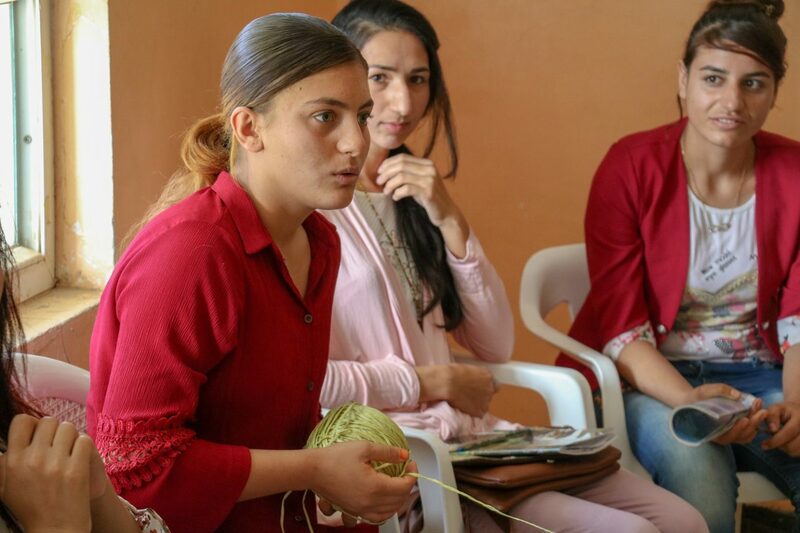 I don’t think about the things they have endured, I think about the hope they represent for their families and neighbours, and about the hope that this programme brings where Medair is working throughout northern Iraq. Medair’s work in Iraq is made possible by EU Civil Protection and Humanitarian Aid, US Agency for International Development, the International Humanitarian Fund, and generous private donors.